The program buried in the Agriculture Department budget is brought to the surface in the “2018 Congressional Pig Book” compiled by Citizens Against Government Waste, a watchdog that has put together the catalog of pork, earmarks, and other questionable federal spending since 1991. “Earmark spending, deficits, and debt all grow when the lights are turned off—all grow when attention is focused somewhere else,” Sen. Ted Cruz, R-Texas, said Wednesday at the organization’s press conference announcing the new edition. The 2018 edition of the Congressional Pig Book exposes 232 earmarks of taxpayers’ money totaling $14.7 billion, doubling the 2017 tally, Thomas A. Schatz, president of Citizens Against Government Waste, told reporters. At this rate, within two years, lawmakers will pass their $29 billion record in earmark spending set in 2006, Schatz said. —$2.7 billion for the Joint Strike Fighter program to add 20 F-35 fighter jets. The program, in place for 17 years and seven years behind schedule, so far has cost more than $406 billion, close to double an initial estimate of $233 billion. “An April 2015 Government Accountability Office (GAO) report noted that the lifetime operation and maintenance costs of the most expensive weapon system in history will total approximately $1 trillion,” the Pig Book states. Lawmakers should direct funds to programs and projects with “the greatest need or potential benefit,” the Pig Book says. —$13 million to the National Park Service’s Save America’s Treasures grants program, created to preserve historic landmarks, art, and publications. Obama called for the program’s elimination in his fiscal 2011 budget, and it had not received earmarks from 2010 to 2016. But, Schatz said, it got $5 million in fiscal 2017 and nearly three times that in fiscal 2018. “The annual ‘Pig Book’ has been described as the most unpopular book in Washington,” said Cruz, congratulating Citizens Against Government Waste for revealing “some of the worst pork spending” in the federal budget over the years. 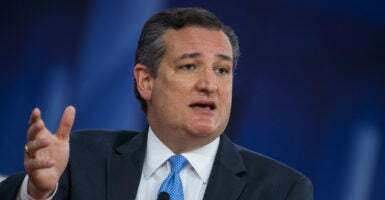 “With some politicians, I guess that might make it tied with the U.S. Constitution and third-grade arithmetic, all of which they hope to be able to disregard,” Cruz quipped. “But for those of us who fight every day for fiscal sanity, who are trying to bring some order to government spending and to stop the pattern we have seen decade after decade of bankrupting the next generation, the ‘Pig Book’ is an invaluable tool and resource,” the Texas Republican said. In some cases, lawmakers offer “fewer details, less transparency, and more secrecy” about surviving earmark spending, Schatz said, as has been the case since fiscal 2011, when they supposedly placed a moratorium on new earmarks in the budget. In publishing its annual exposé on “egregious” pork barrel spending, Citizens Against Government Waste highlights spending that was requested by only one chamber of Congress, wasn’t the subject of hearings, or serves only a local or special interest, among other criteria. “What we hope to accomplish is a permanent ban on earmarks,” Curtis Kalin, the group’s director of communications, told The Daily Signal in an email. Romina Boccia, deputy director of the Roe Institute for Economic Policy Studies at The Heritage Foundation, said Congress’ Joint Select Committee on Budget and Appropriations Process Reform is wrong to consider bringing back earmarks. Some lawmakers want to do this to “grease the wheels” for more bipartisan compromise on spending fights, Boccia said in an email to The Daily Signal. Earmarks are a vehicle of cronyism and political favors, lining the pockets of corrupt politicians, while feeding a swamp that is undermining American families’ ability to achieve their version of the American dream. … Looking the other way when waste and cronyism are rampant in federal spending is both morally and ethically wrong.